Mayview Manor was an elegant 138-room hotel built in Blowing Rock, North Carolina by Walter Alexander. The grand hotel opened in 1921 and continued serving guests until 1966. Mayview Manor was constructed of pre-blight chestnut wood and native fieldstone. It's exterior was covered with chestnut bark. Mayview was considered a perfect getaway for the rich, and elegant entertainment and fine dining were a hallmark of the hotel. For over 40 years the Boots and Saddles Ball, held during the week of the annual Blowing Rock Charity Horse Show, was one of the most popular events at Mayview Manor. After it's closure in 1966, Mayview Manor sat dignified and empty until it was demolished for a housing development in 1978. 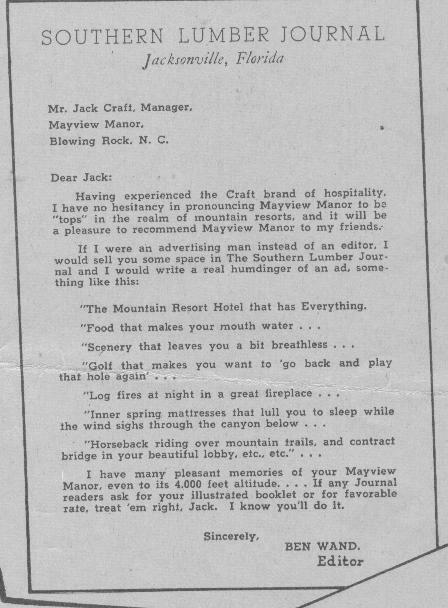 These photos were taken during the 1930s when my great-grandfather, John (Jack) Gordon Craft, leased and managed Mayview Manor. I wanted to share these wonderful images with those who are interested. The building, that was once called Mayview Manor, no longer exists but the memories, that are passed on from generation to generation, always will. 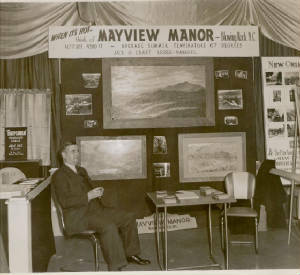 Photos taken while my great-grandfather, John Gordon Craft Sr., leased and managed Mayview Manor.